Hortus Camdenensis | Hoya imperialis Lindl. 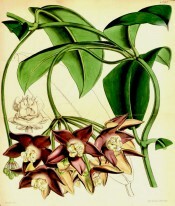 Frost tender, twining climber with downy stems and elliptic, leathery, fleshy leaves, to 23cm long, and umbels of up to 12 star-shaped, reddish brown to purple flowers, to 7cm across, with white coronas, in summer. To 6m or more. [RHSE]. ‘This the most noble climbing plant we have ever seen. Beautiful specimens in flower have for some months been in our possession, sent from Borneo by Mr. Lowe, jnr. ; but we have refrained from publishing an account of them, under the supposition that no living plant had reached England. We are now, however, able to state, that the plant is in the possession of Mr. Lowe of Clapton, who has already begun to put it into the trade. Imagine, then, a true Hoya, with woolly stems, leaves six inches long, and clusters of the most magnificent flowers, forming a diadem of ten rays; each flower fully three inches in diameter, and with the delicate texture of the common Hoya carnosa, and he will have some notion of this superb species.’ [BR sub t.68/1846]. ‘Dr. Lindley does not say too much of this plant when he remarks, in the place above quoted, "this is the most noble climbing plant we have ever seen:" and this was spoken of the dried specimens we believe, aided by flowers preserved in spirits. With greater truth may it be said of the living plant, now that we have had the pleasure to see it exhibited in full flower at the Horticultural Fête in the Regent's Park Gardens (June, 1848), where it obtained the highest prize given for new plants, and again in the stove of the fortunate possessors of this rarity, Messrs. Lucombe, Pince, and Co., at their Exeter Nursery. A cluster of its flowers is indeed one of the most striking objects we have ever seen; the leaves too are large and handsome. It is a Hoya with glossy fleshy leaves of a deep purplish chesnut colour [sic – probably a reference to the flower colour], having the expanded flowers full three inches in diameter! rendered more conspicuous by the ivory-white of the central column of fructification.’ [BM t.4397/1848]. Recorded in a hand written entry in an 1850 catalogue held at the Mitchell Library, inscribed on the front Wm. Macarthur, 23rd Dec. 1854 [ML 635.9m]. Certainly grown in the gardens at this time it was requested of Kew on 1st February, 1849 [MP A2933-1, p.177] and of John Lindley at the Horticultural Society on 1st July, 1849 [MP A2933-1, p.182a]. One of these is the likely source.